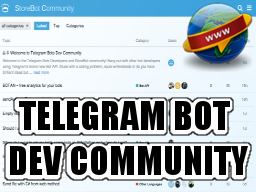 Dev Community: Hang out with other bot developers using Telegram’s brand new Bot API. Welcome to the Telegram Bots Developers and StoreBot community! Hang out with other bot developers using Telegram‘s brand new Bot API. Stuck with a coding problem, acute writersblock or do you have brilliant ideas but butterfingers when it comes to coding? Read some tips and tricks to get the most out of your bot or just ride the waves of our different topics to get some inspirational flow going. Read and suggest ideas on how to promote your bots and get maximum of users for your bots. Something lacking? Suggestions? Tell us! @dumik5 or @amarok5 on Telegram. Looking to connect with fellow members and interested in developing application and founding company for a new application. This bot gathers trending topics around the Internet at 1 place. We are currently gathering trends from Google, Twitter, YouTube and Vimeo.